Sharp has introduced two new A4 desktop color multifunction printers for the technology driven workplace, delivering strong workflow capabilities and leading-edge security features, all in a compact design. 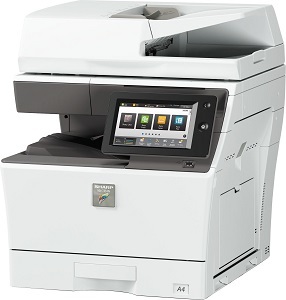 The new Advanced Series MX-C304W and Essentials Series MX-C303W boast full multifunction capability out of the box, including copy, print, scan and fax, as well as wireless networking for easy access from mobile devices. Per the press release, the new models also share Sharp’s award-winning, easy-to-use 7″ (diagonal) touchscreen display, and offer exciting new features including conversational AI. The new MFP Voice feature with Amazon Alexa enables users to interact with the machine by using simple verbal commands. These models also easily integrate with today’s complex network environments and offer quick access to an expanded list of cloud services that include Box and Dropbox, helping businesses manage their workflow with greater efficiency. Additionally, Adobe Embedded Print Engine technology enables users to direct print PDF files from a variety of sources with greater performance and rendering accuracy.